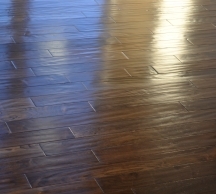 Winter weather can mean a lot of trouble for your hardwood floors. Keep them clean and protected! Winter is a time of great joy for many people, especially when the snow comes. As a homeowner, though, you might feel a little conflicted. Sure, the winter wonderland is beautiful and your children will enjoy playing in it on their days off from school. But winter is often brought inside as well, and this can mean trouble for your wood floors. Flooring gaps and damage from rock salt can cause homeowners a lot of headaches. Luckily, there are simple steps you can take to help protect your wood floors from the damages of winter. Read on for more information! The saying goes “an ounce of prevention is worth a pound of cure”, and this proverb certainly holds true for hardwood. People will almost certainly be bringing the outdoors inside with them during the winter. Rock salt and other snow-melting compounds can lead to major scratching issues on your wood floor. Even if it doesn’t do that much, it will still leave an ugly white residue on it that will need to be cleaned promptly. The best way to protect your wood floors from damage is “an ounce of prevention”. Place mats near all of the entrances to your home. Entrance mats reduce the amount of snow and salt that are tracked into your home. Alternatively, you can ask your guests to remove their shoes and leave them on a mat before entering your home! During the winter, it’s normal to have the heat turned up. The relative humidity in the air also drops during this time. Natural wood floors respond to changes in environment, expanding and contracting according to the changes in humidity. Gaps and thin cracks usually appear during the winter because of the drop in relative humidity. Don’t panic about this! Without the ability to move, your flooring could end up damaged! But if you’re still worried about the potential for damage, you could place a humidifier in the room to try and increase the humidity and trigger the planks to expand again. Laminate hardwood, on the other hand, is less responsive to changes in humidity and doesn’t move as much. If you’re looking at having your wood flooring replaced in the near future, this option might make more sense for you than natural wood. This entry was posted on Friday, January 27th, 2017 at 11:45 am. Both comments and pings are currently closed.